..displayed conspicuous and gallant conduct in battle, when voluntarily leaving his work as cook, his gallantry was noticed by several officers. 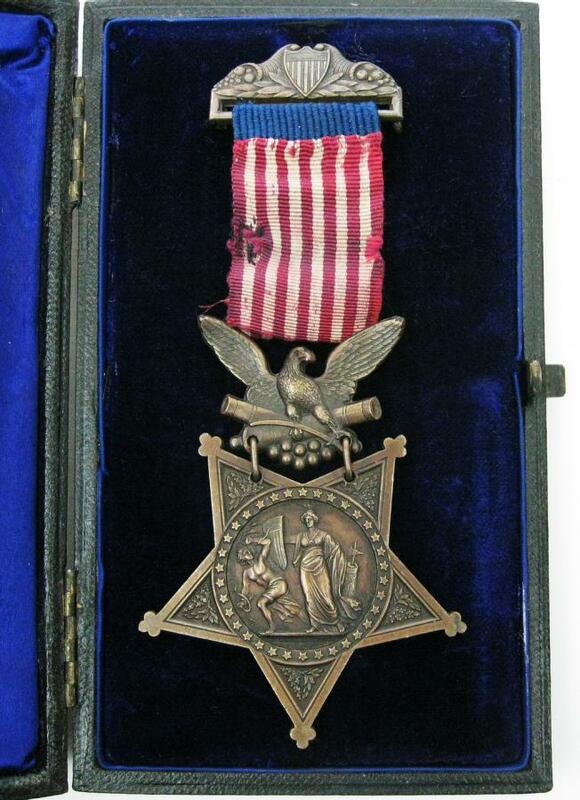 (Click to enlarge) Medal of Honor presented to Private George Hobday, A Troop, 7th Cavalry, awarded June 23, 1891. Private Hobday left his work as cook when the fight opened, seized his carbine and rushed into the thickest part of the action; his conduct was so conspicuous that my attention was attracted to him personally. This man exposed himself so much that I expected to see him shot down every moment. Private Hobday is a cool and gallant soldier and deserves to be rewarded. According to Army records, at the time of the battle Hobday was a forty-eight-year-old trooper from Pulaski County, Illinois, and one of the eldest and longer serving enlisted men in the regiment. In fact, Hobday was fifty-one at the battle and was an immigrant from the United Kingdom, having changed his given name from Stephen to George upon arrival in the United States in the 1860s. He was born Stephen John Hobday in the summer of 1839 at Boughton Aluph and was baptized on August 4 that same year. His father John Davis Hobday, born in Boughton in 1815, worked as a laborer and gardener. He married Mary Austin in August 1836, a twenty-three-year-old from the neighboring parish of Westwell on the outskirts of Ashford in county Kent in the southeast corner of England. Over the next twenty years John and Mary had eight children, all born in Kent County: Valentine John in 1838, Stephen John (the subject of this post) in 1839, Harriett in 1841, Mary Ann in 1845, James Moss in 1847, William in 1849, John Davis in 1851, and lastly George Edward in 1855. Stephen’s mother died in 1896 and his father in 1898. (Click to enlarge) Among the discrepancies concerning Private George Hobday is this photograph that is often depicted as being that of Hobday. 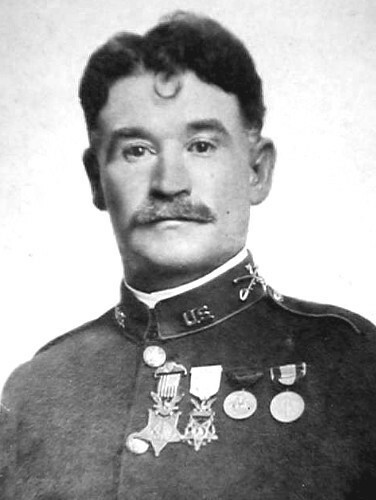 However, the 7th Cavalry trooper pictured is wearing a 1904 design Medal of Honor, and two campaign medals that were not issued until more than a decade after Hobday’s death in 1891. This photograph likely is of 1st Sgt. John E. Clancy. In 1861, Stephen was still living at home in Boughton and working as a domestic servant. Sometime during that decade he emigrated to the United States. He made his way to Memphis, Tennessee, where in 1868 he enlisted in the Army for three years, taking his youngest brother’s name, George. Hobday’s enlistment record states that he was a twenty-six-year-old laborer from Pulaski County, Illinois, and stood five feet eight with grey eyes, brown hair, and a dark complexion. He was initially assigned to Captain John Christopher’s D Company, 25th Infantry Regiment, which served in Memphis and later at Jackson Barracks, Louisiana, during the Reconstruction Period. Hobday was later transferred to D Company, 14th Infantry Regiment under the command of Captain Joseph Vanderslice at Fort Columbus, New York. He was discharged in August 1871 at the expiration of his first enlistment. (Click to enlarge) Inscription on the reverse side of Private Hobday’s Medal of Honor. The Congress to Private George Hobday, Troop A, 7th Cav’y for bravery at Wounded Knee Creek, S. D. Dec. 29 1890. Five years later in September 1876 George Hobday enlisted at Philadelphia, Pennsylvania, for five years. Perhaps the widely publicized Little Big Horn campaign that summer spurred him to sign back up with the Army. He was assigned to G Company, 7th Cavalry, which had lost one officer, seven non-commissioned officers, and six privates killed in their fight under Major Marcus Reno’s command. As a member of G Company he likely fought at the Battle of Canyon Creek under the command of Lieutenant George Wallace in 1877. After completing his five-year enlistment in 1881 at Fort Meade, Dakota Territory, Private Hobday went to Chicago, Illinois, and on September 24 of that year he enlisted again for another five years. He was assigned to Captain Henry Nowlan’s I Troop and later transferred to Captain Moylan’s A Troop, completing his enlistment in 1886 still at Fort Meade. Again, Hobday made his way to Chicago and enlisted for another five-year hitch; this time he was assigned to B Company, 23rd Infantry Regiment and posted at Fort Brady, Michigan. In April 1888, he was transferred back to the 7th Cavalry and Captain Moylan’s A Troop stationed at Fort Keogh, Montana Territory. It was this assignment that found Private Hobday serving as a cook in the cavalry camp near the Wounded Knee Creek Post Office on December 29, 1890. Hobday’s original headstone at the Jefferson Barracks National Cemetery misspelled his name. In October 1891 at Fort Riley, Kansas, Private George Hobday finished his fourth enlistment. He traveled to St. Louis where, at the age of fifty-two he enlisted for a fifth time being assigned as an Ordnance Private at the Saint Louis Powder Depot at Jefferson Barracks, Missouri. Shortly after joining the unit he contracted double pneumonia and died on December 22, 1891. He was buried in the Jefferson Barracks National Cemetery with a headstone upon which his name was misspelled HOLDAY and with no mention of his being a Medal of Honor recipient. Major John Kress, George Hobday’s commander, inventoried his personal effects, including his Medal of Honor and sent them to Hobday’s father at Kennington, Kent, England. John Hobday died seven years later, and apparently, Private George Hobday’s Medal of Honor passed to his youngest brother, the George Edward Hobday whose name Stephen John Hobday had taken when he emigrated to America. (Click to enlarge) This Hobday medal collection includes Private George Hobday’s Medal of Honor and his cavalry insignia and was for sale by The London Medal Company for £12,500 or almost $20,000 in January 2014. George Edward Hobday, the younger brother, served a lengthy career in the British Army, retiring after World War I in British Columbia, Canada. When he passed away in 1933, George Edward passed his medals along with his brother’s Medal of Honor to his daughter, Mrs. Nora Hobday Bryce. She also came into possession of her brother, Cecil Hobday’s medals. Cecil had fought with the 2d Canadian Division during World War I and was killed in the Battle of the Somme in 1916. 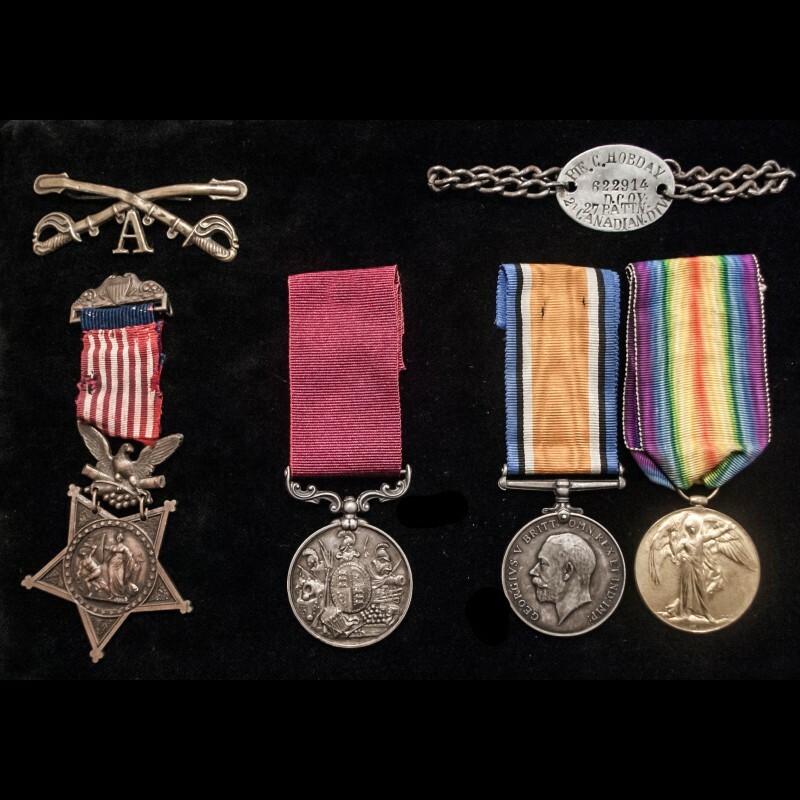 The entire collection of medals was offered for sale by The London Medal Company for £12,500, including Private George Hobday’s Medal of Honor, George Edward Hobday’s British Army Long Service and Good Conduct Medal, and Cecil Hobday’s Identification Bracelet and World War I medals. While this medal set would be an enviable acquisition for any military collector, potential buyers should be forewarned that purchasing or selling a Medal of Honor is a violation of U.S. law that carries a penalty of up to six months confinement. 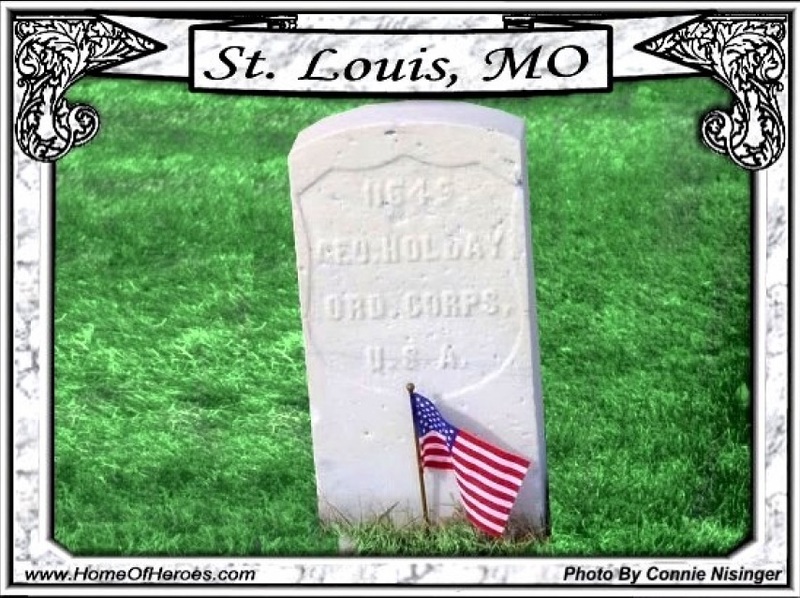 In 2004, a newspaper article brought attention to the discrepancy on Private George Hobday’s headstone at the Jefferson Barracks National Cemetery. The Congressional Medal of Honor Society rectified the issue by replacing the headstone correcting his name–at least to the one documented in his Army service records–and recognizing him as a Medal of Honor recipient. On official records he is still listed as being born in Pulaski County, Illinois, and is not on the list of foreign-born recipients of the Medal of Honor. 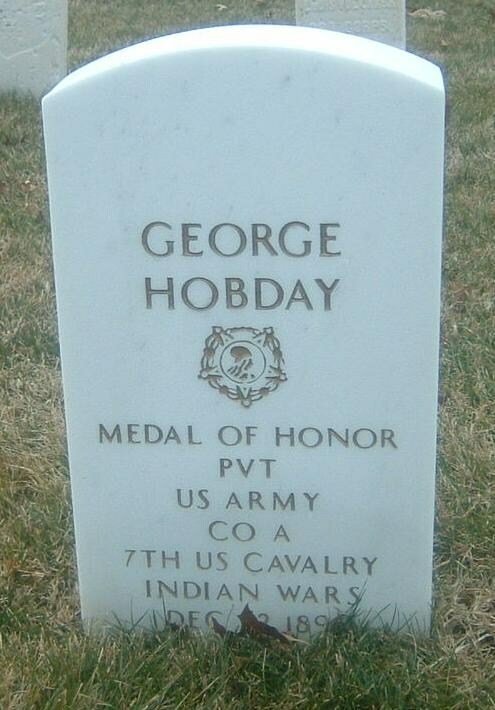 Private George Hobday is buried in the Jefferson Barracks National Cemetery, Saint Louis, Missouri. Hobday’s headstone was replaced after a newspaper article in 2004 pointed out the discrepancy in his original headstone. 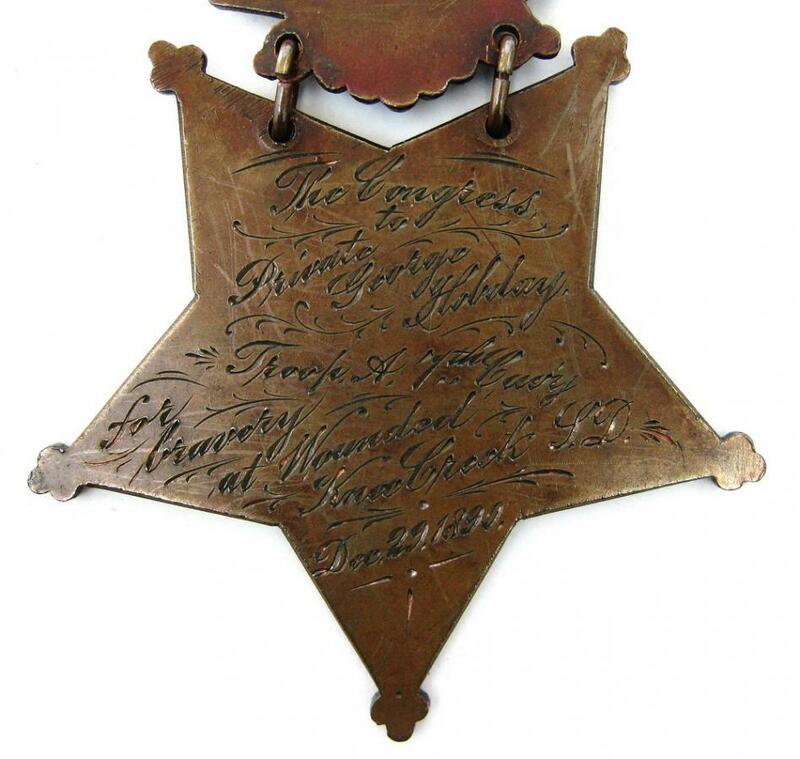 Chelsea Military Antiques, The London Medal Company, http://www.london-medals.co.uk/the-historically-important-controversial-united-states-of-america-indian-wars-medal-of-honor-awarded-to-pte-george-hobday-a-co-7th-cavalry-united-states-army-for-bravery-at-the-battle-of-wounded-knee-creek-on-29th-dec-1890-displaying-conspicuous-gallant-c accessed 13 Sep 2013. Adjutant General’s Office, Medal of Honor file for George Hobday, Principal Record Division, file 3466, Record Group: 94, Stack area: 8W3, Row: 7, Compartment 30, Shelf: 2; C. H. Carlton to Adjutant General’s Office dated 22 April 1891, Source data: The National Archives, Principal Record Division, file 6776, Record Group: 94, Stack area: 8W3, Row: 7, Compartment 30, Shelf: 3. Research conducted by Vonnie S. Zullo of The Horse Soldier Research Service. FreeBMD, England & Wales, FreeBMD Birth Index, 1837-1915 [database on-line], Provo, UT, USA: Ancestry.com Operations Inc, 2006; Class: HO107, Piece: 471, Book: 10, Civil Parish: Aluph Boughton, County: Kent, Enumeration District: 7, Folio: 8, Page: 9, Line: 10, GSU roll: 306866; Class: HO107, Piece: 1622, Folio: 345, Page: 18, GSU roll: 193523; Class: RG 9, Piece: 516, Folio: 55, Page: 18, GSU roll: 542653; Class: RG10, Piece: 962, Folio: 54, Page: 12, GSU roll: 827248; Class: RG11, Piece: 951, Folio: 53, Page: 13, GSU roll: 1341227; Class RG12, Piece: 703, Folio: 60, Page: 6, GSU Roll: 6095813; FreeBMD, England & Wales, FreeBMD Death Index, 1837-1915 [database on-line], Provo, UT, USA: Ancestry.com Operations Inc, 2006, Original data: General Register Office, England and Wales Civil Registration Indexes, London, England: General Register Office. Ancestry.com, U.S. Army, Register of Enlistments, 1798-1914 [database on-line], Provo, UT, USA: Ancestry.com Operations Inc, 2007; National Archives and Records Administration (NARA), Washington, D.C., Returns from Regular Army Infantry Regiments, June 1821 – December 1916, Microfilm Serial: M665, Roll: 238. The Institute of Heraldry, “Decorations & Medals,” http://www.tioh.hqda.pentagon.mil/Awards/dec_awards_military.aspx accessed 14 Sep 2013. The 7th Cavalry trooper in the photograph is wearing the 1862 design Medal of Honor, the 1904 design Medal of Honor, the Indian Campaign Medal authorized in 1907, and the Spanish Campaign Medal authorized in 1905. When the 1904 design Medal of Honor was created the Army sent the new medal to all living Medal of Honor recipients and they were authorized to wear their original medal and the newly designed version. Based on the medals, this photograph was taken in 1907 or later, more than fifteen years after George Hobday died in 1891 at the age of fifty-two. Ancestry.com, U.S. Army, Register of Enlistments, 1798-1914 [database on-line], Provo, UT, USA: Ancestry.com Operations Inc, 2007; John F. Finerty, War-Path and Bivouac, or The Conquest of the Sioux, (Chicago: Donohue & Henneberry, 1890), 456. Ibid. ; Adjutant General’s Office, Final Statements, 1862-1899, “George Hobday,” at Fold3, http://www.fold3.com/image/276120937/?terms=george_hobday#276120937/accessed 13 Sep 2013. FreeBMD, England & Wales, FreeBMD Death Index, 1837-1915 [database on-line], Provo, UT, USA: Ancestry.com Operations Inc, 2006, Original data: General Register Office, England and Wales Civil Registration Indexes, London, England: General Register Office; Ancestry.com, Canada, Soldiers of the First World War, 1914-1918 [database on-line], Provo, UT, USA: Ancestry.com Operations, Inc., 2006, Images are used with the permission of Library and Archives Canada; Commonwealth War Graves Commission, London, United Kingdom, The War Graves Of The British Empire, Bulls Road Cemetery, Flers Thilloy Road Cemetery, Beaulencourt, France, Roll #: 31274_184884. 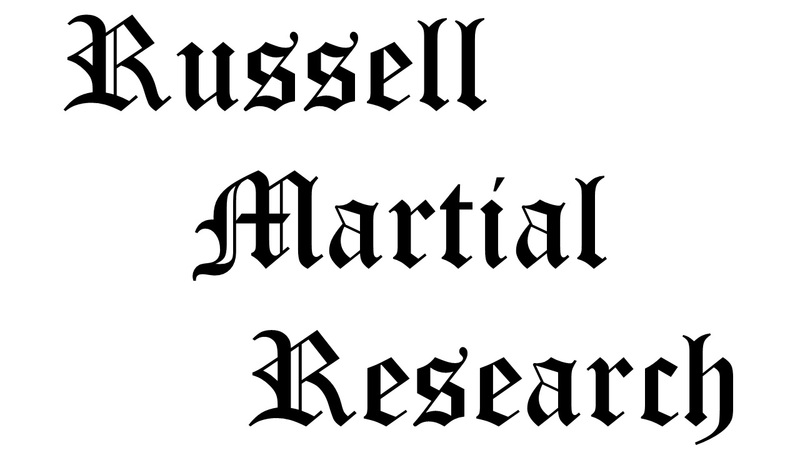 Citation for this article: Samuel L. Russell, “Private George Hobday, A Troop, 7th Cavalry – the Gallant Cook from Kent, England,” Army at Wounded Knee, (Sumter, SC: Russell Martial Research, 2013-2015, http://wp.me/p3NoJy-6Q), updated 28 Oct 2018, accessed date __________. This entry was posted in Award Recipients, Enlisted and tagged 7th Cavalry, 7th Cavalry Regiment (United States), Big Foot, Cavalry, Fort Riley, George Hobday, Hunkpapa, Lakota, Medal of Honor, Miniconjou, Oglala Lakota, Pine Ridge Agency, Pine Ridge Indian Reservation, Sioux, Wounded Knee, Wounded Knee Creek, Wounded Knee Massacre. Bookmark the permalink. I recently came into possession of a digital copy of the majority of award recommendations stemming from the Pine Ridge campaign to include Captain Myles Moylan’s letter recommending Private George Hobday for the Medal of Honor. I have updated this post on 13 Nov 2014 to include an excerpt from that letter. I am very interested in reading this informative article which includes details of Private Hobday who was my relative. His younger brother, the actual George Edward Hobday, was my great grandfather. I stumbled upon your article about a year ago when I was doing some basic research on my family. At the time I was sitting with my father who was equally as intrigued by the information you provided in your writing. My family, as you have noted, has had a long, deep military history which continued with George Edward’s son Leonard, my paternal grandfather, and his two sons my father, Bob, and his brother, Manning, both having served in WWII. My uncle having been killed in Falaise , France. I am continuing to do more family research and will be looking further into our military involvement. Thank you for your writing. I would be interested in staying in touch. Sir… Thank you for taking the time to comment. I just came in to a large file of Medal of Honor applications with some additional information that I am adding to older articles. I recently updated Hobday’s post. Any idea what happened to the medals? To my recollection there was one medal which went to a collector, somewhere….I’m unsure where or to whom. I’m curious as to where you learned so much about this event? I see from your bibliography you use ancestry.com to which I, too, have referred. Do you have any other reliable sources you might suggest I use? Thank you, I’ll keep in touch. Mr. Hobday… I try to stick with primary sources such as military reports, letters from or diaries from the participants, newspaper articles, etc. ChroniclingAmerica.loc.gov is an outstanding site containing newspapers from across the country dating from 1836 to 1922. Ancestry.com is good for census, and veteran records, and Fold3.com is good for military records, particularly for officers. Both sites require a membership. I also have a very reliable researcher in the DC area that I hire occasionally to dig through the National Archives. Her name is Vonnie Zullo, and uncovered a treasure trove of award documents from the campaign contained in two document boxes, 1,000 of pages. For Hobday, I actually obtained much of my information, or at least clues on information to look for, from the UK auction site that was selling the medal collection. They took the webpage down shortly after I posted my article on Hobday, possibly because I pointed out that selling a Medal of Honor is illegal.